The Sensorform Remote Monitor for Fault Indicators enables fault events detected by the Fault Indicator to be notified immediately via SMS to up to twenty different mobile phone numbers. The RM-FI is a separate unit, which connects to the AUX output on the Fault Indicator. 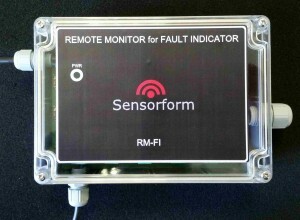 The Sensorform RM-FI (Remote Monitor for Fault Indicator) is used to allow remote monitoring and immediate notification of Medium Voltage Fault Indicators. The unit contains an internal GSM Modem. The RM-FI connects to the AUX signal from the Fault Indicator. When a fault is detected by the Fault Indicator, the AUX signal goes active, which causes the RM-FI to send an alarm SMS to one or more pre-programmed mobile phone numbers. The mobile numbers can be reprogrammed by SMS text. The unit is powered from Mains voltage and includes an internal long-life, non-rechargeable, user-replaceable battery, which allows the unit to send SMS texts when the mains power may be absent after a fault has occurred. An SMS message is also sent when the voltage of the backup battery goes low. The RM-FI takes a standard SIM card, which is user-accessible. The unit is housed in a robust, UV-resistant, IP65-rated enclosure, which makes it suitable for both indoor and outdoor installation. Quality, Safety and Environment Suparule adheres to the very highest national and international safety and environmental standards. As well as delivering a quality service on time, every time, we are committed to providing a safe environment for our employees, our clients and the general public. Suparule is certified to ISO 9001:2015. Suparule Systems Limited, Suparule House, Holland Road, National Technology Park, Limerick, Ireland. Tel. : +353-61-201030 | Fax. : +353-61-330812 | E-Mail: info@suparule.com. Registered in Ireland. Company No. 152205.